The Gilliam family calls Summer Scamper “Koen’s Race.” They treasure the event as an annual milestone marking just how far their beloved Little Dude has come. Born with a depressed heart rate causing damage to his brain, Koen was rushed to our hospital within an hour of his birth to get access to the life-saving technology, cutting-edge research, and expert care he needed. He spent the first month of his life in our neonatal intensive care unit and intermediate nursery. Koen’s parents, Nickole and Ryan, weren’t able to hold him right away, but every day nurses encouraged them to be involved and nurture tiny Koen. Read Koen's full bio on our blog. When Noor celebrated her first birthday last summer, her family and friends were filled with appreciation and excitement. “We didn’t know if we would ever get here,” recalls Noor’s mother, Reema. 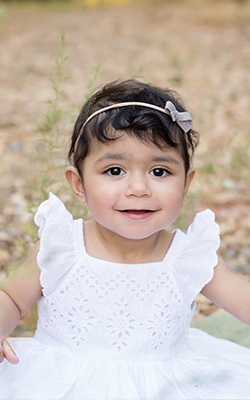 Shortly after birth, a condition called biliary atresia caused Noor’s liver to fail and led to a domino effect throughout her tiny body. At Lucile Packard Children’s Hospital Stanford, she spent the majority of her time in the intensive care unit and as the situation worsened, was placed on dialysis and intubated. A liver transplant was her only hope. Read Noor's full bio on our blog. Criss was 23 weeks pregnant with her twin girls, Alexia and Celeste, when prenatal tests showed that the babies had signs of congenital heart defects. In the midst of grieving the diagnosis, Criss and her husband, Americo, also learned there was hope—their doctor in Roseville recommended they seek the help of the expert care team at Lucile Packard Children’s Hospital Stanford. “Within days, I was walking through the doors of the hospital that would change our lives forever,” says Criss. At Packard Children’s, Criss met with obstetricians, neonatologists, geneticists, and a nephrologist who conducted a series of blood tests, urine samples, ultrasounds measuring fetal growth, and finally, the highly anticipated scan to see the twins’ heart defects. The anomalies seen in the girls’ hearts, kidneys, and umbilical cord were consistent with 22q11.2 Deletion Syndrome, a chromosomal disorder that can affect nearly any part of the body. Read the twins' full bio on our blog. Read Lucca's full bio on our blog. Sienna is one sassy 6-year-old. She loves to strike a pose and already has her runway strut perfected. Her presence in front of the camera is magical. Sienna is remarkable for many reasons. One is that she has autism and does not communicate verbally. Her mom, Karyn, discovered that Sienna can express herself through modeling and fashion. Sienna’s photos and story show that there are no limits for children with autism. She has become an inspiration for people around the world and has nearly 20,000 Instagram followers! Read Sienna's full bio on our blog. Yassen’s mom, Hagar, was 5 months pregnant when prenatal screening found an issue with Yassen’s heart: it only had three chambers. At the time, the family lived in Texas, and Yassen underwent the first of what was supposed to be two surgeries to repair his heart. A second surgery, performed at a hospital in California, was not successful, and soon after, it was discovered that one of his heart valves was leaking. 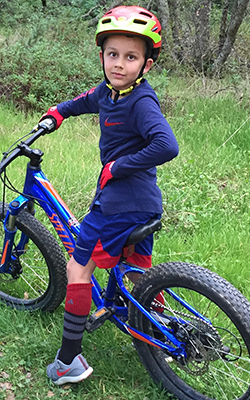 The family moved again, to yet another hospital, which ultimately determined that Yassen’s situation had become so dire that he needed the expert care only available at Packard Children’s. Yassen and his mother—who at the time was pregnant with Raneem—were flown by air ambulance to Packard Children’s, where the Betty Irene Moore Children’s Heart Center is renowned for its 97.3% survival rate. 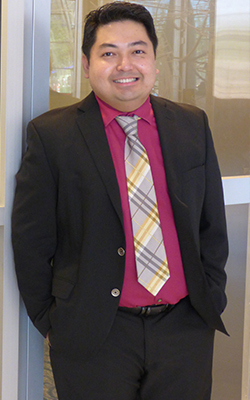 Read Yassen's full bio on our blog. Gina was five months pregnant with Gianna when she received a call that she says shattered her life: Gianna had cystic fibrosis, a devastating disease with no cure. Gina had never even heard of cystic fibrosis before, and now she was told it was a “death sentence” and life would be difficult not only for her child, but for the rest of the family as well. After sleepless nights and many tears, Gina and her husband prepared themselves for an uncertain future, praying that they would receive the courage and wisdom to support the child they already adored. Gianna has received care from Packard Children’s Cystic Fibrosis Center nearly all her life. At 4 months old, a bacterial infection caused one of her lungs to collapse. Gianna recovered well, leaving the hospital a week earlier than expected. It would, unfortunately, not be the last time Gianna was admitted to Packard Children’s. Over the years, she has been hospitalized five times. Gina and her husband have worked closely with Gianna’s care team to ensure she can live as normal a life as possible. 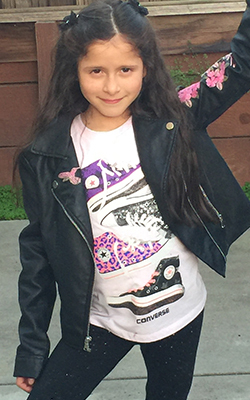 Now 8 years old, Gianna is a bubbly little girl who loves singing, dancing, playing tennis, and visiting her grandmother in Colombia. She will be attending her first Summer Scamper this year, and will be on stage to help us count down the start of the race. Read Gianna's full bio on our blog. While initially shy, Christian grew into a very affectionate and loving 5-year-old. He loved to give hugs. He was very compassionate towards others – especially Olivia, his mother, and grandma. He could also be silly or mischievous. He loved to test boundaries and play jokes – to see people’s reactions or make them laugh. At times, he was like Curious George: inquisitive, curious, and daring. He could be rebellious and stubborn at times, but a good explanation would satisfy him – unless he offered up “a deal”. Christian loved everything to do with cars, trucks, machines, trains, or Legos. But his passion was superheroes, with Batman being his favorite. On the morning of Sunday, January 24, 2016, Christian woke up with cold-like symptoms, and by that evening, he complained of respiratory distress. We took him to our nearby emergency department for evaluation, and after spending nearly an entire night and next day at the hospital, he was transferred to Packard Children’s pediatric intensive care unit (PICU). During the transport, Christian lost consciousness, one of his lungs collapsed, and he experienced internal bleeding. Both Christian and the doctors at Packard Children’s fought for his life, but he passed away on January 25, 2016, 20 minutes after arriving at the PICU. The doctors determined that Christian contracted Influenza B and bacterial (streptococcal and staphylococcal) pneumonia and was overwhelmed by sepsis. He did receive his annual flu vaccine, but somehow still caught the flu. Since Christian’s passing, the Bereavement and Family Guidance Program at the Lucile Packard Children’s Hospital Stanford has opened their arms and welcomed us into their family. Our first experience with the program happened in 2016 during the 11th Annual Day of Remembrance, where families and friends gather to honor the children from the Packard Children’s community who have passed away. Read more of Christian's family's letter to you on our blog. At 18 months old, Aaron was in the 75th percentile for height, but only 5th percentile for weight. His mom, Brittany, thought high-fat foods like peanut butter might help him gain weight, but the toddler seemed to hate it. Then, when Aaron was a bit older and was given a granola bar, he talked about his throat being itchy and then threw up. Brittany’s suspicions worsened. She and her husband had Aaron tested for food allergies. Sure enough, he tested positive for nut allergies, especially pistachios. Brittany did everything she could to protect her son from life-threatening reactions. She found a nut-free preschool. She stashed cupcakes in the freezer so Aaron could participate in celebrations. Still, there was constant fear. Aaron was a normal, active 4-year-old who was apt to be impulsive and sneak treats whenever he found them. How could they keep Aaron safe, but still encourage him to have normal childhood experiences? Read Aaron's full bio on our blog. Meet one of our 2018 Summer Scamper Hospital Heroes, Perla Bautista-Muench, BSN, RN, MSN, outpatient epilepsy case manager at Lucile Packard Children’s Hospital Stanford. As a case manager, Perla serves as an all-around resource for epilepsy patients and families with complex care needs. Her typical day includes corresponding with about 20 patient families and helping them with tasks such as coordinating different care teams, communicating with insurance providers, and triage consulting. Read Perla's full bio on our blog. Read Freddie's full bio on our blog.